Taipei, Taiwan – 19th March 2014 – G.SKILL International Co. Ltd., the leading high performance memory designer and manufacturer, proudly announces the “G.SKILL OC World Cup 2014” overclocking contest! The OC World Cup Champion will receive USD $10,000 – one of the largest single cash prize in competitive overclocking history. The live finals will be held during Computex 2014. Online qualifiers will be held at HWBOT (http://hwbot.org) from 24th March to 27th April 2014, featuring 3 benchmarks including the highest memory frequency, SuperPI 32M, and 3DMark Fire Strike. The top 6 online qualifier contestants will be eligible to attend the OC World Cup 2014 live finals at Computex 2014, and an opportunity to compete for the grand prize of USD $10,000! All contestants may keep the G.SKILL TridentX 3000MHz kits provided for the competition. All contestants will be awarded a G.SKILL DDR4 sponsorship. The live qualifier competition starts on the first day of Computex on June 3 at 9.30AM and ends on June 5 at 5.30PM. The contestants each get two 4-hour time slots to compete in four different benchmarks. The best two proceed to the final, where two of the three benchmarks are chosen by the finalists themselves. Ultimately, everyone is aiming for the big USD $10,000 cash prize for the winner. Luckily there is also a cash prize for the first and second runner-up, respectively USD $1,500 and USD $1,000. The two runner-ups also receive memory kits and for each of the six qualified overclockers there is a G.SKILL DDR4 sponsorship. That is an awesome set of prizes! In order to qualify for the competition, check out the G.SKILL OC World Cup 2014 Qualifier competition page. Remember that if you qualify, you need to cover your own hotel and flight costs. Good luck everyone! “OC World Cup 2014 will be a great opportunity for extreme overclockers to showcase their skills to the world and a chance to take home the largest single cash prize in OC history, so overclockers better step up their game for a shot to win USD $10,000!” commented by Frank Hung – Product Marketing at G.SKILL. Established in 1989 by PC hardware enthusiasts, G.SKILL specializes in high performance memory and SSD products, designed for PC gamers and enthusiasts around the world. Combining technical innovation and rock solid quality through our in-house testing lab and talented R&D team, G.SKILL continues to create record-breaking memory for each generation of hardware and hold the no. 1 brand title in overclocking memory. 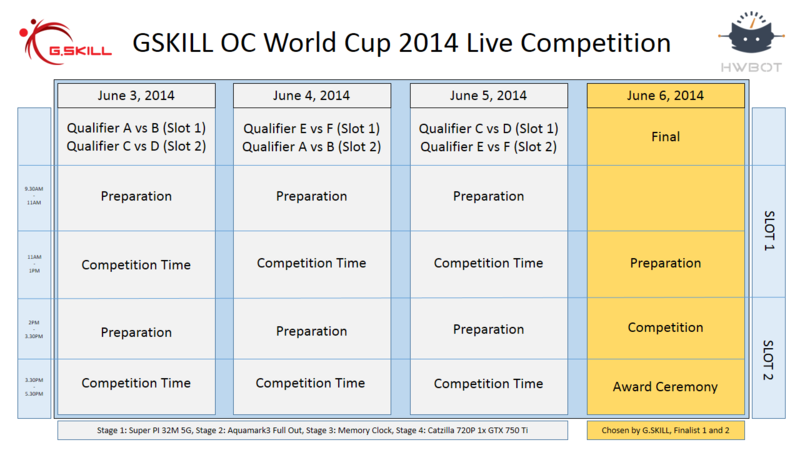 G.SKILL OC World Cup 2014 Final is closed since 6 June 2014. The time slots are chosen by the competition participants. The winner of the online qualifier has first pick, the runner-up second pick, and so on. Contestants will receive 1x GTX 750 Ti prior to the competition. The competition allows for contestants to bring their own hardware, including (but not limited to) processor, graphics card, motherboard and memory. The contestants will not be allowed to bring their own GTX 750 Ti for the CatZilla stage, but are allowed to bring any graphics card for the three other stages. The graphics card must be retail. The contestants are allowed to bring any amount of backup hardware. The organization will prepare 12x GTX 750 Ti (2x for each contestant). The cards will be marked and checked on ASIC quality before the competition. One of the cards will be shipped prior to the competition. In case the GTX 750 Ti shipped prior to the contest is dead before the contest, the participant may buy another card in retail under supervision of the contest organizer. Contestants are allowed to bring their own overclocking gear such as cooler, copper container, thermal bottles. The contestants are also required to bring their own electronic equipment like multi-meter or thermometer. Contestants cannot use any computer equipment not provided by the organization. This includes USB flash drives, DVD/CD-ROM or hard disk drives, etc. The organization will provide USB flash drivers with the software and transferring the validation files. The organization will prepare 6x SSD with OS and overclocking tools pre-installed. If you want to have a tool included which is not in the pre-approved list, please contact the competition organizer. During the preparation phase, LN2 is allowed to be used. Contestants are free to try any benchmark applications, but submitting results can only be done during the competition phase. During the competition phase contestants can update their results at any time. After the judge verified the result, the scoreboard will be updated. The final approval of the results will be done after the conclusion of every competition phase. During the competition phase, the contestant is free to choose any of the four benchmarks to submit results. The contestants have 2x 2 hours of competition time during the Qualifier Phase. When on stage, during the preparation and competition time, the contestants must be by themselves on stage and are not allowed to accept any physical help. Any outside help or someone joining the stage will result in automatic disqualification. Physical help includes but is not limited to setting up the system, changing hardware components, alter BIOS settings, or handle the cooling equipment. In laymen terms: helping with advice “coaching” is allowed, but touching the system is not. Contestants must submit the result right after it was done. After the competition phase finishes the benchmark results can no longer be updated and the best update of the result will be the final score. However if the benchmark was started before the end of the competition phase, the end result is still eligible for submission. The Judge has the right to ask contestants to re-run benchmarks to verify results. Both finalists can chose one of the three stages in the Live Final. The benchmark options are limited to the HWBOT benchmark suite and the hardware limitations are limited to the general competition hardware (see Hardware Details section). This is an live event. Participants are invited to compete against each other face to face. Submissions made during the event will be shown here.